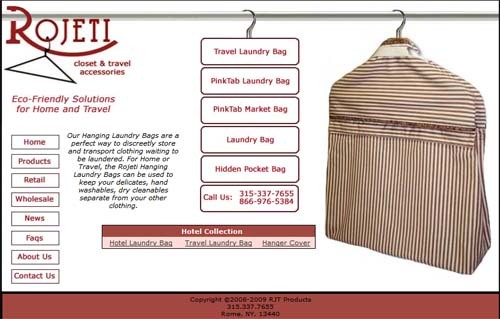 The site provides information about Rojeti Hanging Laundry Bags that are designed to discreetly store and transport clothing waiting to be laundered. For Home or Travel, the Rojeti Hanging Laundry Bags can be used to keep your delicates, hand washables, dry cleanables separate from your other clothing. Technologies - The site utilizes Active Server Pages (ASP) with interfaces to a mySQL database.